Δεν πίστευα στα μάτια μου όταν βρήκα στις σελίδες της Πινακοθήκης της Αμερικής Library of Congress Prints and Photographs Division Washington, D.C. 20540 USA, αυτά που εκθέτουμε εδώ. Δηλαδή παραδοσιακές και άλλες ενδυμασίες περιόδου μεταξύ 1873 και 1943 (πολλές απ’ αυτές παραδοσιακές) στην περιοχή γύρω από το Αιγαίο, Μικρά Ασία και Ελλάδα. Μπορείτε κάλλιστα κι εσείς να βρείτε αυτές τις φωτογραφίες αλλά θεώρησα σωστό να συμμαζέψω και να τις παρουσιάσω σαν μια ομάδα που ενδιαφέρουν ένα ορισμένο εθνικό κέντρο. Δεν ξέρω αν οι φωτογραφίες αυτές και άλλες υπάρχουν και πού υπάρχουν στα αρχεία της πατρίδας μας, όμως είναι σημαντικό να τις διατηρούμε γιατί κατ’ αυτό τον τρόπο όχι μόνον αφήνουμε μια άξια λόγου παρακαταθήκη στις επόμενες γενεές αλλά και εκπληρώνουμε το καθήκον που έχουμε σαν Ελληνισμός και σαν ιστοσελίδα με τίτλο “ΜΝΗΜΕΣ – Αλησμόνητες Πατρίδες”. Σας παροτρύνω λοιπόν να σχολιάσετε τις φωτογραφίες αυτές οι οποίες στην πράξη ανήκουν στην Πινακοθήκη της Αμερικής αλλά δεν έχουν κάποια συγκεκριμένα δικαιώματα τα οποία έχουμε βρει που θα μας εμποδίσουν να τις προβάλλουμε. Αν έχετε δικές σας φωτογραφίες ενδυμασιών από οποιαδήποτε περιοχή της Μικράς Ασίας και επιθυμείτε να τις μοιραστείτε μαζί μας θα χαρούμε να τις αναρτήσουμε εδώ. Summary: (1) Christian woman villager of Hanoı̈a (Chania); (2) Christian villager of Hanoı̈a (Chania); and (3) resident of Isfakia (Sphakia). 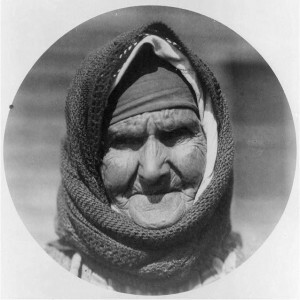 French caption from book: Crête: Figure 1: Villageoise Chrétienne de Hanoı̈a; Figure 2: Villageois Chrétien de Hanoı̈a; Figure 3: Habitant d’Isfakia. Illus. in: Les costumes populaires de la Turquie en 1873 / Hamdy bey … et Marie de Launay … phototypie de Sébah. Part II, plate II (opposite p. 106). Summary: (1) Yuruk woman nomad of Bigha (Biga); (2) Christian woman of the Island of Chio (Chios); and (3) Christian woman of Lemnos. French caption from book: Iles: Figure 1: Femme Yuruk de Bigha; Figure 2: Femme Chrétienne de Chio; Figure 3: Femme Chrétienne de Lemnos. Illus. in: Les costumes populaires de la Turquie en 1873 / Hamdy bey … et Marie de Launay … phototypie de Sébah. Part II, plate V (opposite p. 117). 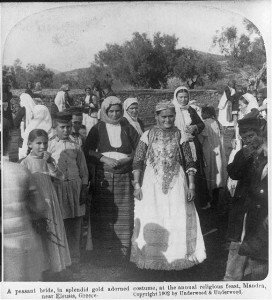 Summary: (1) Christian resident of Mételin (Lesbos); (2) Christian woman of Mételin (Lesbos); and (3) Christian woman of Sumbèki (Sími) Island. French caption from book: Iles: Figure 1: Habitant Chrétien de Mételin; Figure 2: Femme Chrétienne de Mételin; Figure 3: Femme Chrétienne de Sumbèki. Illus. in: Les costumes populaires de la Turquie en 1873 / Hamdy bey … et Marie de Launay … phototypie de Sébah. Part II, plate VIII (opposite p. 123). Summary: (1) Muslim teacher (hoca) of Selanik (Salonica); (2) chief Rabbi of Selanik (Salonica); and (3) bourgeois from Monastir (Bitola). 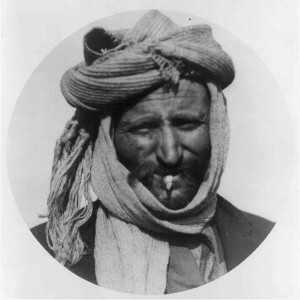 French caption: Selanik: Figure 1: Hodja de Selanik; Figure 2: Haham-bachi de Selanik; Figure 3: Bourgeois de Monastir. Illus. in: Les costumes populaires de la Turquie en 1873 / Hamdy bey … et Marie de Launay … phototypie de Sébah. Part I, plate XXI (opposite p. 84). Title: The fruit peddler of Greece A Greek of the old school who wears this time onoured costume in the ancient town of Thebes. Medium: 2 photographic prints (1 page) : gelatin silver. Summary: Photographs show a fruit peddler with his donkey and a head-and-shoulders portrait of a bearded Greek man wearing a cap. Negative series code stamped on page: LC-C26. In album: European pictures (1923 trip), p. . Copyright by Carpenter’s World Travels. Date Created/Published: c1907 Jan. 30. Stereo copyrighted by Underwood & Underwood. Caption card tracings: Holidays Easter; Dance Folk; Greece Megara; Photog. I.; Shelf. Summary: (1) Yuruk nomad of Bigha (Biga); (2) Christian resident of the Island of Chio (Chios); and (3) Christian of Lemnos. In album: Schools and student portraits, Ottoman Empire. Title: [Students, High School, Thessalonikē] / Sebah & Joaillier, Phot., Constantinople. In album: Imperial schools, architectural plans and student portraits, Ottoman Empire. 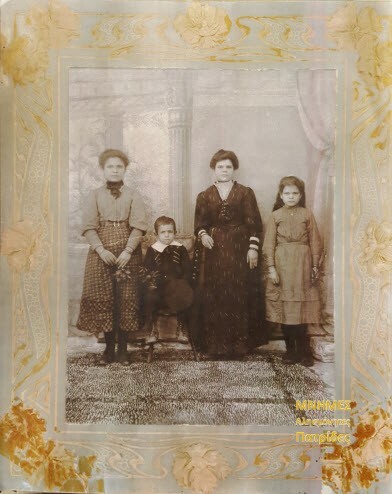 Summary: (1) Married Muslim woman of Selanik (Salonica); (2) married Jewish woman of Selanik (Salonica); and (3) Bulgarian woman of Perlèpè (Prilep). Osman Hamdi Bey, 1842-1910 , authorDate Created/Published: Medium: 1 photomechanical print : photogravure.Summary: (1) Muslim man of Rhodes; (2) and (3) Married Muslim woman of Rhodes. Greek_infantry_officers_1912 Title: Street scene in Athens, GreeceDate Created/Published: c1919 Dec. 31.Medium: 1 photographic print on stereo card : stereograph.Summary: Large group of women and children in narrow street.Reproduction Number: LC-USZ62-66107 (b&w film copy neg. of half stereo)Rights Advisory: No known restrictions on publication. Summary: Man and woman seated at small table. Medium: 1 photographic print : platinum ; 20 x 13 cm. Summary: Photograph shows a young woman dressed in a classically-inspired gown, holding a lyre as if playing it. Used as illustration of an Austin Dobson poem of the same title published in In Arcadia / Emma Justine Farnsworth, 1892.
costume_colonel_1897 Title: Greek Reservists on “King Constantine”Creator(s): Bain News Service, publisherDate Created/Published: [between ca. 1910 and ca. 1915]Medium: 1 negative : glass ; 5 x 7 in. or smaller.Reproduction Number: LC-DIG-ggbain-20110 (digital file from original negative)Rights Advisory: No known restrictions on publication. Summary: (1): Armenian priest of Koniah (Konya); (2): Mullah of Koniah (Konya); and (3): Greek priest of Koniah (Konya). 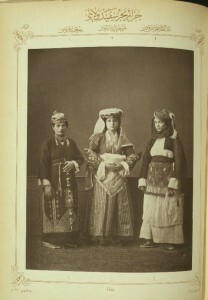 Summary: (1) Armenian bride; (2) Jewish woman of Constantinople; and (3) young Greek girl. Summary: (1) Christian resident of Magossa (Famagusta) ; (2) Christian woman of Magossa (Famagusta); and (3) Greek monk of the Monastery of Tchiko, near Lefke (Lefka). French caption from book: Iles, Chypre: Figure 1: Habitant Chrétien de Magossa; Figure 2: Femme Chrétienne de Magossa; Figure 3: Religieux Grec, du Monastère de Tchiko, près Lefke. Illus. in: Les costumes populaires de la Turquie en 1873 / Hamdy bey … et Marie de Launay … phototypie de Sébah. Part II, plate IX (opposite p. 125). Summary: (1) Bulgarian woman of Ahi Tchèlèbi; (2) Greek woman of Hasskeuı̈ (Khaskovo); and (3) peasant woman of Baı̈djas. Photoprint by Near East Relief. Summary: Orphaned children wearing light blue uniforms in Constantinople.